This trip came about after I had come across these 1998 Arizona Geological Survey photos of an inclined railway that were simply identified as "Bonanza Mine Group". 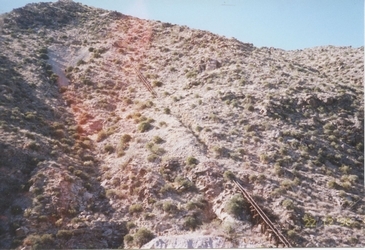 With more than 15 mines in Arizona having the word Bonanza in their names, it took a while to work through the list using Google Earth to identify that the inclined railway had been photographed in the area of the Bonanza mine located in the Harcuvar Mountains 7 or 8 miles north of Wenden Arizona. I thought that I would take a trip down that way to see the structure for myself. The route to the Bonanza Mine area is pretty straight forward. Bonanza Mine Road is a good dirt road that exits Alamo Lake Road several miles north of Wenden. The mine group apparently encompassed 36 claims at one time covering hundreds of acres in at least 3 different sections of land. There is not a lot of information available about the operation. The first work may have started around 1900 and seems to have continued itermittently through 1950 or so. The recovery of copper and some gold seems to have been the objective. There are many shafts and adits in the area. One location about a third of the way up the mountain side in the photo below is identified on topo maps of the area as the "Bonanza Mine". There is a waste dump at that location and several large concrete foundations. The inclined railway is located a little over a mile beyond this location. These photos are at the location identified as the Bonanza Mine. There was once some heavy duty equipment installed here. When I studied the route into the inclined railway on Google Earth prior to the trip, I was concerned about the road going up and over the ridge. I could see several hairpin switchbacks. It turns out that I was correct to be concerned. When I did the trip, the road had been freshly worked with a bulldozer and I was hopeful. The route up to the first switchback was loose but easy 4wd but I could not make the turn in one attempt. I did not have the confidence to try and negotiate the switchback by backing up to the edge and taking a second or third try, so I turned around and made my way back down to a wide spot where I parked and then walked up and over the ridge line and on to the railway. It was a very steep hike up that hill! 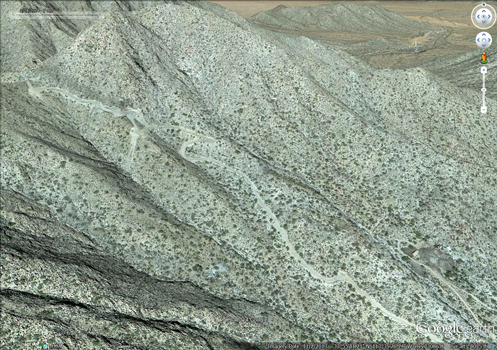 The roadway over the ridge can be seen in this Google Earth View. The mine dump and concrete foundations at the location identified as the Bonanza Mine site can be seen in the lower right portion of the image. There is a great view to the east across the McMullen Valley from the saddle above the Bonanza Mine. The Harquahala Mountains are in the distance. Remnants of an old road/trail that once serviced the mine workings to the west can be seen. The old trail was much narrower than the one in place today. The vehicles/wagons traveling that road would have had to have been quite small! To the west from the pass on the ridge, the old inclined railway can be seen. It is on a spur trail. The main road turns south and continues for about two miles. It appears that some sort of work must be going on at the end of the road in that direction. Google Earth shows recent "development" work occuring over there. There has been quite a bit of deterioration of the old incline since 1998, the time of the AGS photos. 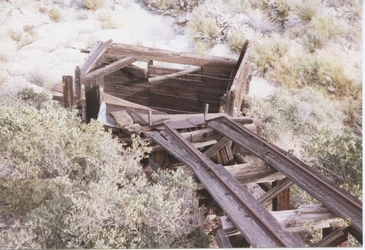 The elevated portion just above the ore bin which looks intact in the early photo has completely collapsed. The old railway stopped just short of the ore bin. It appears that the rocks were dumped from the rail line onto a metal chute that led into the bin. The two photos looking down into the bin from the incline show how the structure appeared in 1998 and its appearance today in 2014. It is interesting how the rails were bent to serve as "stops" for the ore cars. 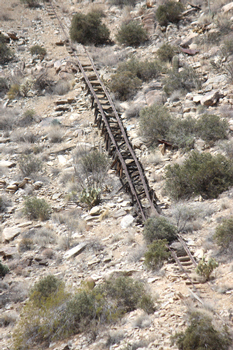 The upper portion of the incline while deteriorated is still standing. The rails are spaced approximately 30" apart. That is different from the 18" spacing of the rails that remain in the adits. The rails were attached to the wood framing with carriage bolts. I have not been able to find any references to the inclne. I do not know its age or exactly how it was operated. 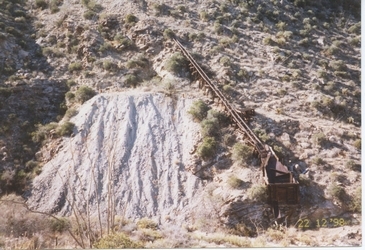 A concrete pad at the top of the incline may have once supported a hoisting machine that raised and lowered the ore car. Google Earth measurements indicate that the inclined railway was nearly 500' long. This is one of the adits that once supplied materials for the incline. Once past the partially collapsed entrance to the adit, one can see the remains of the old mine rails, ventilation piping and timbering. I did not check out the full length of the old adit. The miners' camp at the site consists of a few leveled areas behind low rock retaining walls. Although there are quite a few pieces of corrugated sheet metal scattered about, there is almost no lumber. A few broken stove parts, a can dump, and a bit of broken glass are pretty much all that remain. After the hike into the old inclined railway, I drove back out to the Alamo Lake Road and drove north to the transmission lines at Cunningham Pass. There I turned onto an old road that paralleled the lines and made my way west along the northern edge of the mountains. The Butler Valley extended out to my right. After several miles, I turned on a spur road up into the mountains. While using Google Earth to locate the old railway, I had noticed a couple of buildings down in a canyon a bit to the north of that location. I was on my way to check them out. I have not been able to find any info on this location. From evidence on the ground, the miners were after copper. The more complete shack was quite primitive with no floor. Packrats now call that cabin home. I could not see any evidence of a headframe associated with the old shaft. There were no concrete equipment pads that are usually associated with sites like this. From the second site, I continued making my way along the edge of the mountains towards Cottonwood Pass, which I would use to cross through the Harcuvars back to Highway 60. There were many trails to choose from. There were times that roads did not appear on the maps or my gps, but were headed in the right direction. Everything worked out. I did not turn up into any of the mine sites shown on the maps. Before the trip, I had not seen any buildings or other structures on Google Earth at those sites. The roads that I followed were very narrow. They appear to be traveled these days primarily by atvs. The photo on the left is typical of the terrain along the edge of the mountains. Harcuvar Peak is the prominent peak visible from the road. When the road turned eastward towards Cottonwood Pass, I walked over to a third area that I had scoped out on Google Earth. There were a few collapsed wooden structures and a bit of other mining debris to be seen. As the road climbed back into the mountains, there were good views of the Butler Valley to the west. This may be one of the emptiest valleys in the state. I bet that stargazing from out there would be great. The very far mountains in the distance may be in California. The road across Cottonwood Pass takes advantage of a low area in the rugged Harcuvar Range. There were four wheeling challenges to be negotiated on the road towards Cottonwood Pass. This section of road was very narrow. There were rocky areas to slowly navigate. Once again, the primary traffic seems to be atv related. I am not certain how Cottonwood Pass got its name. Today, there no signs of any cottonwood trees anywhere in the area. The wind certainly funnels its way through here! This photo is looking east from the pass out to the McMullen Valley, Wenden, and Salome. It appears to have taken quite an effort to construct the road down to the east off of Cottonwood Pass. Many sections are elevated on fill dirt held back by tall retaining walls. The visibility out over the hood of my Tacoma can sometimes be difficult. I had to go quite slowly down off this hill. I had to get out once or twice to see which direction the road was turning. It was late afternoon as I came down off the pass. That is my favorite time to be out in the desert. It was just a few miles on to Highway 60 between Wenden and Salome.